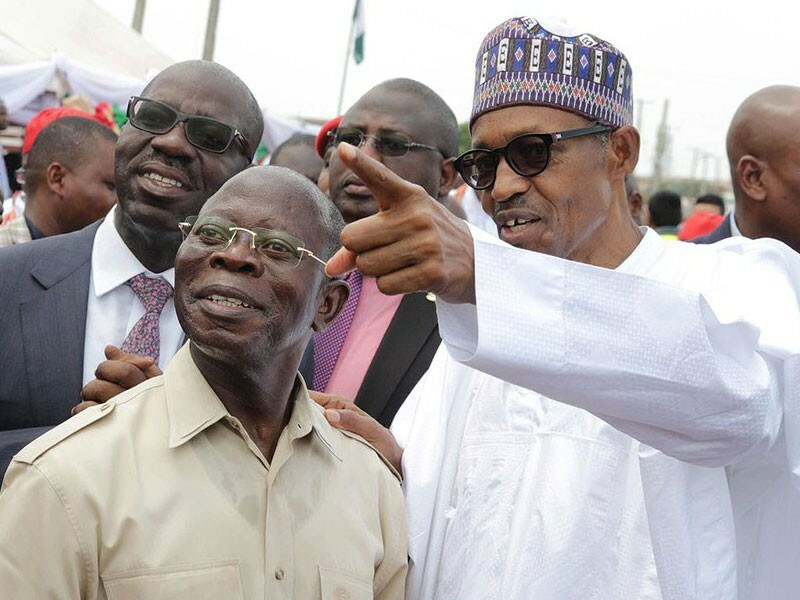 Embarrassed and perturbed by the unending and messy controversy generated by the conduct of its primary elections, President Muhammadu Buhari has given Adams Oshiomhole, national chairman of the All Progressives Congress, a marching order to resolve all the complaints, hues and cries. He specifically directed the leadership of the party to address issues that have dotted governorship primaries in some states before the National Executive Committee (NEC) meeting of the party next week. The president issued the directive during a meeting with first class traditional rulers from Ogun State who visited him last weekend. The presidential directive is coming a day after the APC chairman accused some chieftains of the party of plotting his removal over the outcome of the primaries. A source at the meeting quoted President Buhari as assuring that nobody who participated in the party primary elections but feel aggrieved would not be served justice. A Presidency staff also confirmed the ultimatum to Oshiomhole. The source said the president was aware of the ripples the APC governorship primary election was causing in some states like Adamawa, Ogun, Zamfara and Imo . The situation, he said, if not urgently addressed could hurt the party in many ways, hence the directive to the chairman to speedily “clear the mess” in the next one week. the national chairman is insisting on doing what he claims to be the right thing, but in some of the cases in question, even the president is not too comfortable with the handling of the matter because some of the governors have made a very strong case on the impropriety of some of the decisions of the national chairman. “The president has told him to clear the mess this week, because the distraction the controversy continues to ignite does not bode well for the polity, the Presidency, the party and even the wellbeing of members,” the source said. An APC governor from the North told Daily Sun that that the president was concerned about the mounting complaints and protests against the primaries. He revealed that the president told them when they met with him that he was scandalised by the quantum of protests that have trailed the primaries. The governor who did not want his identity revealed said: “We met with Mr. President over the primaries. He was visibly pained by the growing protests across the country against the exercise. He knows the truth about the primaries, he knows that the national leadership of the party is to blame for what we are seeing today. He promised to resolve all the concerns. President Buhari is said to be perturbed that some of the people badly affected by the primaries controversies were his key loyalists. “Look at the situation in Ogun, Amosun is president’s key loyalist. We know the vice president is from there and has his interest. We raised it at our meeting with Mr. President and he is not happy about that. His position was corroborated by an APC chieftain who is also close to Amosun. “By far, the most embarrassing for even the president and which has presented the chairman as lacking capacity, is the allegation that the governorship primary in Ogun State that was said to have produced the individual behind who the chairman is supporting never held. The governor also said Yari was disconcerted with the turn of events in his state that have resulted to the Independent National Electoral Commission (INEC) insisting on not accommodating a candidate of the party. “Yari is hoping that the matter would be resolved by the president before the window for substitution of candidate elapses,” he said. Final day for the substitution of presidential and National Assemblies candidates by parties is November 17, while of that of governorship and state is December 1. Meanwhile, Oshiomhole has said despite the reports in the media, over 90 percent of members of the APC were comfortable with his leadership style. He spoke after a delegation of the APC from Kwara State met President Buhari at the Presidential Villa, Abuja. According to him, only one or two state governors elected on the platform of the party were not happy with him because he insisted on following due process. Asked to comment on the alleged gang-up to remove him, he replied: “I need to consult a lawyer who understands legal language to decode it to my layman understanding to be able to deal with it. But the only thing I think that I just want to clarify is that I have seen banner headlines, people are just calling me, there is crisis in APC, that my office is under threat, some APC persons are very angry and all that. “I just want to say that this is my finest hour. I am being encouraged by the level of participation in our primaries and, of course, the more open, the more the democratic process is. Most people today who are actively involved in politics that we might describe as not too young to run, the only model that they have seen was the PDP model which ran for 16 years. So understandably, the culture of opposition, the culture of cheating, the culture of power determine outcome has been so well entrenched. “And what we are trying to do under my leadership of the APC is to work consciously to entrench the core values of progressive politics which is that the people must necessarily lead, the members should not be distant spectators, the party members should be the drivers of this process. Yes, we recognize power, yes we recognize protocol but at the end of the day, power must flow from the membership when it comes to primaries and it must flow from the Nigerian people when it comes to the popular election. The APC national chairman added: “Somehow, it has been my lot to be on the side of the oppressed whether that oppressed is a worker, whether he’s a senator or House of Reps; whoever you are, I think that my job is simply well cut out for me so that we uphold the rule of our party and the Electoral Act and the spirit of progressive politics and I think that I can say comfortably that about 90 percent of APC membership are happy, it is not possible to have 100 percent.